Scoop.it's smart suggestion engine crawls more than 40 million web pages every day. Simply give us a few keywords and we'll find content gems that you can easily curate and publish. This article explains how to get started and how to make the most out of this great technology. Having problems? Check out our troubleshooting and optimization guide. A topic is simply the Scoop.it page on which you will be able to publish curated pieces of content. You can use a Scoop.it topic as a blog or content hub. When you sign up for your account, the first thing you'll be prompted to do is create your topic. Enter the name of your topic and select the language you'd like to curate and receive content suggestions in. Note: while the Scoop.it website is in English, you can discover, curate and publish content in many different languages. Click on Create a Topic and you're ready to go! You can sort your suggestions by relevance (occurrence of the keywords you chose in the pieces of content) or you can prioritize freshness and get recent content first. Don't forget to click on the Apply button. By using the filters on the left of the suggestion panel, you can zoom in on some specific content formats. Check or uncheck the content types you want to filter/leave out and click on Apply. If you want to look for content about a very specific topic, you can use the "Search only in title or URL" feature. Keep in mind that you'll probably see fewer suggestions, but they might end up being more relevant to your topic. Be aware that some keywords might be too vague to specifically filter the content you want. For instance, if the name of your topic page is "renewable energy market trends", energy will be too vague as it's also used as a noun in many common sentences. Keywords can be single words (eg: curation) or expressions (eg: content curation). To combine several words into an expression simply hit enter after the last word of the expression. Be careful, ["renewable energy"] is not the same as ["renewable"] ["energy"]. Also, it's very important for you to be able to use the "Exact Match" feature. 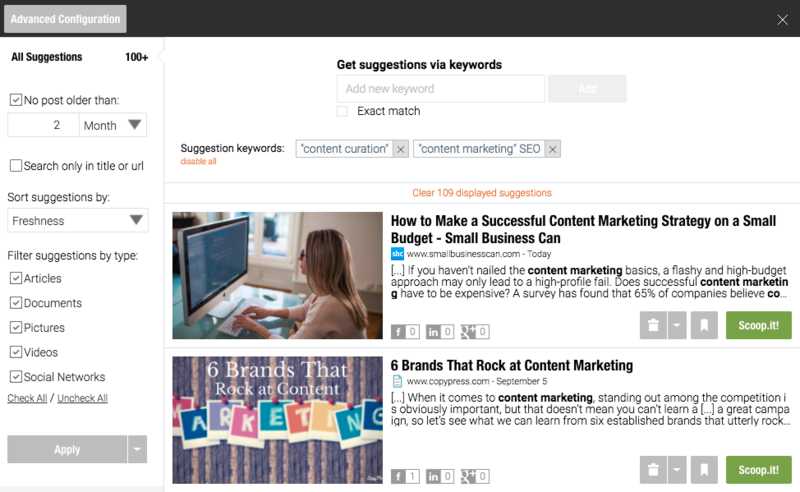 Whenever you enter keywords with the "Exact Match" box checked, quotes will appear around them. will return pieces of content featuring both words, but not necessarily next to each other. As the Exact Match feature is off, our Suggestion engine will take into account other forms of these words as well (ex: renew, energies...). will return the exact expression = the two words next to each other with the exact same spelling. The Exact Match is recommended for brands, acronyms, proper nouns, expressions. will return (1) content that mentions the word "renewable" (which is unspecific and vague) or (2) content that mentions "energy" (also unspecific and vague). In other words, there is an "OR" relationship between the different keywords you add in Suggestions. To create an "AND" relationship between words, you have to group them into one keyword. If your keyword is ["veolia water" energy], we'll be looking for pieces of content mentioning the expression "veolia water" AND the word energy (or energies). If your keyword is ["veolia water" "renewable energy"], we'll be looking for pieces of content mentioning both expressions (but not necessarily grouped together - one can be at the top of the article, the other one at the bottom). As you can see, you can combine exact match and non-exact match to improve your results. 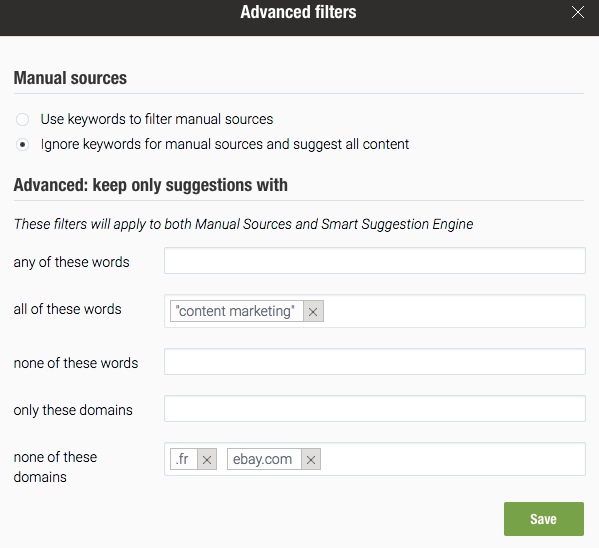 If you want to go further you can click on "Advanced Configuration" and then "Configure your Advanced Filters". It can be particularly helpful if you want to blacklist some websites (see "None of these domains").